Best Bass Boat Ever Made??!! Vexus VX21 On The Water! Most panfish anglers primarily utilize finesse tactics, but that doesn’t need to ALWAYS be the case. Especially if you are missing strikes or feel like your targets are simply nibbling at your bait, try downsized spinnerbaits for panfish. The flashiness of a bent arm spinnerbait can drive big bluegill or crappie insane, and cause them to hammer your bait harder than a more passive, finesse presentation. Stop the pecking, start the eating. 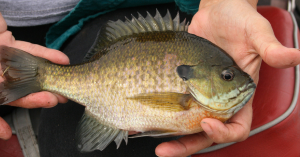 When fishing a spinnerbait for panfish, the first thing to note is ‘where.’ What I look for first is vegetation. 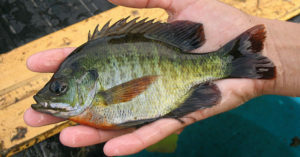 When water warms up and panfish are up feeding on smaller baitfish, they tend to move into grassy flats, the outer edges of weeds, or submerged bushes. They hide out in these types of cover waiting for an easy snack to swim right on by. The spinnerbait imitates this easy snack! Hooksets can be tough, as with any topwater lure, but especially when fishing for panfish, trout, or any other smaller-jawed species. Make sure you give them a chance to fully take your bait. Count to 2 before setting the hook, and don’t go full hardo and over do the hookset. All that can come from a full hardo hookset (aka setting the hook WAY too hard) is you harm the fish while simultaneously ripping the hook out of the mouth. You miss the catch and harm the fish for absolutely no reason. Just a simple lift of the rod will do! If you’re trophy hunting for a slab, or looking to cover water and find the fish, spinnerbaits should be one of the first things you tie on. Cast and wind over bushes, laydown, or any other types of vegetative cover. If they are hiding in there, stick to it. The flashy, bladed arm will trigger strikes sooner or later!